An exceptional offer for new graduates! 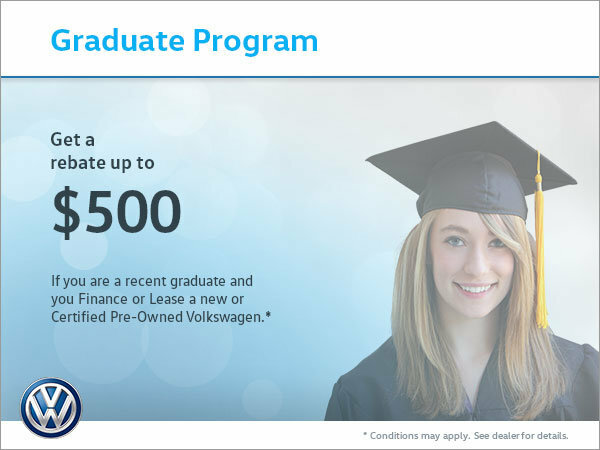 When leasing or financing a new or Certified Pre-Owned Volkswagen, get a rebate of up to a maximum of $500, if you are a recent graduate. Furthermore, take advantage of lower payments, flexibility on how you pay, and the opportunity to lease or finance a Volkswagen right out of school! For more information on the graduate program, contact us today. Start your career with a new vehicle!